Living with back pain isn’t easy. The good news is that getting a little natural relief isn’t a hard thing to do. All you need is a Yoga mat and a few minutes of free time.Try These Yoga Poses for Lower Back Pain. The lower or the lumbar region can be an area that often gets sensitive for most of us at some point in our lives. Whether you’re experiencing your back pain because of a job that requires you to sit for a long hours, arthritic conditions or sports-related issues, gentle stretches like yoga poses can be a good way to stretch the muscle in your hamstrings, back and core and work on easing your back pain. Always check with your physician before beginning a new exercise regimen to ensure that you’re doing what’s best for your body. Here are the five yoga poses to ease lower back pain and relieve that dull ache. Begin by standing on your mat with your hands on your hips. Take a deep breath. As you exhale, bend forward from your hip joints, lengthening your torso as you bend forward towards your knees. If you’re flexible enough, bring your palms or fingertips to the floor without bending your knees. If you can reach down that far, then it’s okay! You can also bring your palms down to the back of your ankles. For an even gentler approach, just cross your arms and hold your elbows while bending forward as best you can without bending your knees. Remain in the stretch up to one minute before releasing the pose. When you’re ready to come back up, put your hands on your hips and slowly return to standing. To begin the cat pose, come down onto your hands and knees (table top position). Round your back and let your head drops down, tucking your tailbone under. Hold the pose for up to eight breaths, then move into a cow. This time, instead of tucking the tailbone, you’re going to reach it up toward the ceiling, but don’t strain. Hold the pose for up to eight breaths and repeat the cat/cow cycle a couple of more times. 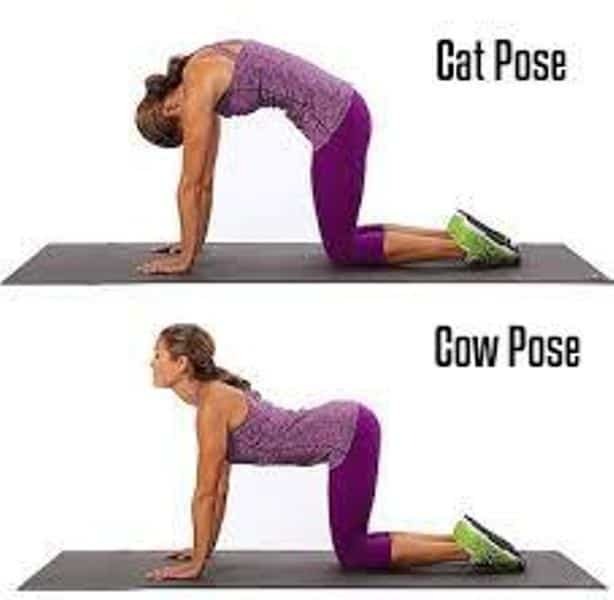 Since you’ve just done cat & cow, you’re poised to move hands into a downwards facing dog. Beginning your hands and knees, your hands should line up with your shoulder, shoulder-width apart. The insides of your elbow should be pointing towards the opposite side of the mat. Your fingers should be spread wide, pointing towards the top of your mat. Press your hips up and back and lift up through the base of your spine, keeping the spine straight. Your feet should be hip width apart. Press your heel towards the floor and feel a good stretch in the hamstrings and calves. It’s okay if your heels don’t touch the floor. We’re all different. Let your head hang freely or look toward the navel. Hold the pose up for eight to ten breaths, then return your knees to the floor. You can rest here, or move down to the next post. The Sphinx is a great pose for toning the spine and stimulating the sacral-lumbar arch. When we sit a lot, the lower back tends to flatten, which cause pain. Sphinx pose promotes the natural curvature of the lower back. Start by laying on your stomach, feet hip-width apart, and brings the elbows under the shoulders. If there is too much pressure on your lower back, you can bring your elbows slightly forward. If you want a deeper bend, place a block under the elbows. Hold the pose for 1-3 minutes, and come out by first lowering your upper body on the floor. Relax on the floor as long as needed. And then come to a child pose for few breaths. To begin the supine twist, lay on your back with your feet straight out in front of you. Stretch your arms to the sides of your body. Beginning with your right leg, bend and bring the knee up over the left leg at the knee. Turn your head toward the right and look toward your right hand, in an opposite direction of your bent knee. Feel a gentle stretch in your lower back and hold the pose for 1-3 minutes. Bring your head back to the center and your leg back to the floor. Repeat on the opposite side of your body. Once you’re done, you can relax in the corpse pose (called Savasana in Sanskrit). Simply lie on your back with your arms at your sides with your eyes closed and relax for a few minutes. Enjoy the benefits of your yoga routine. Stay as long as you like before going about your day. Combat Stress with these 5 Easy-Peasy Yoga Poses! !